Stay cool with a week’s worth of easy, fun water activities! Your kids will love these easy ways to cool off with water. Water playtime activities are always a favorite! And summertime makes them even more popular! We’ve been having tons of fun at the pool and with our water guns. 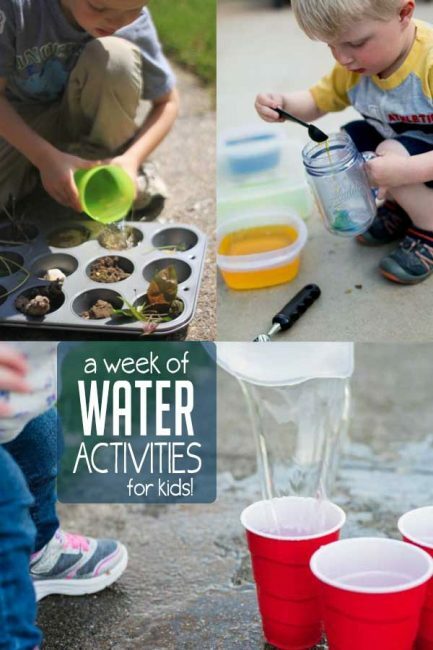 I decided that it might be fun to do a whole week of water fun with the kids! Want more weeks of activities for you? Check these out! A Week of Water Activities for Kids! I’ve chosen some of our favorite activities to do in the summer to do this week, to get outside and enjoy the days when we can! Set up cans on a table outside and shoot them with water guns to knock them down. Practice pouring water from a pitcher into cups. Take it outside! Have a water play day! Set out tubs of water with some scoops to transfer water back and forth. Add color to the water if you’d like. Use a tub of soapy water to wash favorite toys. Take a paintbrush and a tub of water outside and paint various surfaces! Watch what happens when the sun dries it away. Collect various objects of nature in a muffin tin. Pour water into each section to see what absorbs water and what doesn’t. What are your favorite water activities to do with your kids in the summer?